Your weekend love rune forecast and tarot card reading for Nov. 9-11, 2018 for each zodiac sign. Your weekend LOVE Rune and Tarot horoscope is here for all zodiac signs in astrology on November 9-11, 2018. As the Sun continues it's transit through Scorpio this weekend, the moon will pass Sagittarius through Capricorn. This gives a kind of 8-9-10 hit between these energies, each with interesting influences on each other and us all too. Scorpio is the 8th sign in the astrological zodiac, with Sagittarius being 9th and Capricorn the 10th. Each of these three signs has progressive lessons to teach us about topics such as depth, adventure, and hard work. We will experience this weekend shifts between the sun in moody water sign Scorpio paired to the moon in lively fire sign Sagittarius November 8th and 9th, followed by the moon moving into stalwart zodiac earth sign Capricorn on the 10th through the 11th. Despite the different quality of Sagittarius and Capricorn, they follow a working system for self-improvement and societal change for the better. This will represent a rather drastic energy shift as Sagittarius and Capricorn have very different natures to their energy. They way Scorpio's energy will affect them and in turn be effected may have us going from an upsweep of energy to learn all we can, to a state of heads down working on what we've discovered to build something concrete in our lives. The sun in the astrological sign Scorpio matching energies with the moon in zodiac sign Sagittarius may give you a push to venture away from home, even if your only able to explore by way of a documentary, or trying a culturally different food, could prove fascinating. Looking to foreign lands and learning from those you encounter who are very different from yourself may be of deep interest during this transit. 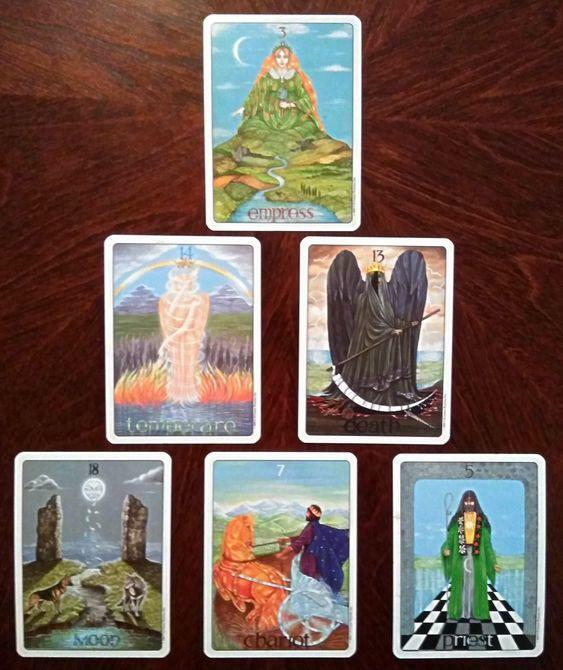 Here's your overall energy 6- tarot card reading for all zodiac signs today using the journey cards of the Major Arcana. When the Sun in zodiac sign Scorpio pairs with the Moon in Capricorn you could feel a maturity, a wisdom if you will, in your dealings with others. You may find yourself turning your thoughts to probing your ability to provide yourself stability and security. Focusing on finances and building projects may come into focus when we're influenced by Scorpio and Capricorn. Overall the energy we will all have for support this weekend is going to create new systems for our relationships and possibly societies a large. Go with the flow and enjoy the adventure and growth that promises to reward us with new perspectives and expanded horizons. The Empress is a tarot card symbolic of nurturing and flowing abundance. This card symbolizes a perfect connection between nature and mankind. The earth mother is the represented figure in on the card. She has much to share but can be restrictive when misused. She reminds us to find joy and appreciation for the resources we have while looking to the places in our lives we can expand further. Temperance is a tarot card of finding balance in all that you undertake. Temperance gives you a lift in creating harmony between the very different energies present at this time. Death symbolizes a significant change is taking place. This shift will likely be for the very highest good for all and may feel rather inspired and transformational at a spiritual level. The Moon brings us our unconscious motives to explore, dreams can become for vivid and the symbolism they contain during these transits is likely to provide you rich rewards. The Chariot indicates energies shifting rapidly, you may one find yourself traveling and exploring yet the next day more sedate and thoughtful. Regardless movement is indicated. The Hierophant is the archetypal scholar, he holds all that has ever been in his records, he is willing to share the knowledge he protects, if you only choose to seek it honestly. Work with an attitude of reverence for our lands, adopt a balanced stance, embrace inner transformation, explore your true feelings, be willing to make rapid shifts and look to our shared human history for lessons. There is symbolism on each tarot card that you can use to provide insight to your daily horoscope when things are unclear. Check out your zodiac sign for this weekend, November 9th-11th, 2018 daily tarot reading and astrology predictions. Cancer, your weekend rune is EIHWAZ. This is a telling sign that you have a major transformation developing. EIHWAZ symbolizes letting the past go to freely move ahead. Unhindered growth is represented by this runic energy. When working with EIHWAZ use the enlightened perspective of not carrying the past ever into your future. That starts in the now, the present is where the work is done. Today consider how far your come, celebrate your successes. Pisces, you have GEBO as your weekend rune bringing with it some manner of blessing. GEBO is symbolic of giving and receiving gifts. If you are a recipient of a gift during this time period, then show how deep your gratitude is with true appreciation. When this rune appears for you, look for the gifts your life is offering you. The gifts of GEBO can be tangible but often they indicate gifts of a spiritual nature. They type that make bring long-term change to your life. Enjoy whatever you may receive offering your own kindnesses in return. Scorpio, your weekend rune is OTHEL. This rune is of significance to those things and ideas you inherit. OTHEL energy asks you to consider the perspectives you may hold on to because you feel they've "always" been there. When you cling to old ways out of comfort you likely miss opportunities to grow in ways that will bring you new joys and happiness. OTHEL can also represent monies coming in. Sometimes, it may be through inheritance or parental figures. Gemini, JERA is your weekend rune. The energy of JERA is somewhat like the Tarot Wheel of Fortune card in that it symbolizes the cycles embedded as the natural order of things. JERA teaches energy is always cycling, there is a flow to all things. If you have been waiting for your luck to change for the better, the time may be upon you. Look to where opportunities for growth are being offered to you. The new position you may find yourself in is likely to be a very positive one as JERA is a rune of rewards for patience. Aquarius, your weekend rune is PERDHRO. This rune is connected to the art of divination, a casting of lots and fate. PERDHRO teaches how to live easier with the unknown. In this energy, you can experience a clear pathway to the truths in your intuitions. When working with this energy you may find you feel more balanced in your perspective to the things in your life you don't yet have answers too. Accepting where you are at this moment with grace and dignity will be taught with PERDHRO. Libra, WUNJO is your weekend rune. This rune often offers joy and wonderful fortune. When you see WUNJO appear in a reading, there may be something in your life that is bringing you a sense of happiness and serenity. WUNJO can offer you a boost to feeling genuinely great about something. When working with WUNJO energy focusing on what is present right now in your life that brings you joy will be of benefit to you. Hold on to positive feelings as long as you can, this will assist you in manifesting more of the same. RELATED VIDEO: I tried manifesting for 100 days. Here's what happened. Taurus, KENAZ is your rune for this weekend. KENAZ is a rune of creative inspiration. A beacon of hope is also represented by this energy. KENAZ supports you in gaining an optimistic perspective. When working with KENAZ look around you and within for those things, thoughts and feelings that incite in your a passion to try something new. Fresh ideas and visionary concepts are in the realm of the rune KENAZ. Virgo, your rune this weekend EHWAZ, bringing to you a feeling of happiness. If you have been challenged of late to gain a positive perspective, EHWAZ offers support to free yourself. EHWAZ is a rune to assist in calming inner tension and restlessness. Seeing EHWAZ suggests something exceptional is available to you. When EHWAZ appears there can even be shifts such as proposals, moving your residence or changing to a job that offers more satisfaction and reward. Capricorn, your weekend rune is ING. This is a lovely indication that you may be able to truly enjoy your home environment. Perhaps family will be of particular focus at this time. ING symbolizes the home fires, warmth and places you may find comfort. When working with upright ING you can experience a period of fertile ideas and constructive gains. Prosperity and fertility are also represented with ING's energy. Seeing ING for you may be feeling a sense of security to your very core. Aries, TIR is your weekend rune. This is the premier rune symbolic of victory. TIR offers you a success in something you have likely worked very hard to obtain. During this time you may find your opportunities fruit with reward more quickly and easily. TIR teaches that perseverance can yield powerful results. If you experience some type of substantial reward, enjoy it fully, holding on to the feeling of success as long as possible. This will help you to feel recharged and ready for more. Leo, your weekend rune is RAIDHO. This rune supports immense growth toward enlightenment. It is a rune of pure transformation energy. Something in this period may complete a shift you've been working on for some time. It would likely be a spiritual shift that will bringer you more in alignment to your higher self. RAIDHO represents physical and spiritual journey's both of which are likely at this time in part to the current transits energies. With RAIDHO encouraging you the changes point toward positive and beneficial ones. You may find you feel excited by what lies ahead while seeing the past from a new perspective. Sagittarius, your weekend rune is NIED. This suggests you may encounter a time when your not as present for someone or something you'd like to be. Absence is an aspect of this rune as is patience. NIED can symbolize a learning period of sorts, that you'll have cause to work through. Sometimes NIED can represent being somewhat tired. If you've been feeling more energized and productive lately, NIED appearing could indicate its time to rest and tend yourself. If that's the case then remember taking time out for yourself will position you to greater success once your energized again. You have the ambition to master a new level with steady progress. Amanda Ilene Sawyer is a writer and Mississippi native who is interested in science, anthropology, and spiritualism. When she's not writing about astrology, numerology, and tarot, she enjoys running her business and designing macrame pieces for her Etsy shop in addition to singing with the Springfield Metro Chorus as a Bass vocalist.